STEELEERS over the Eagles- These two Pennsylvania teams go at it on Sunday in what should be an exciting game. The Eagles, winners of three games by a total of four points, had miraculous finishes in all of them and probably should not have won two of them save for huge mistakes by their opponents. They are either a team of fate or, well, just plain lucky. The Steelers, fresh from their week 4 bye, returns to the gridiron with key players such as James Harrison, Troy Palamalu, and Rashard Mendenhall. The 3-1 Eagles will go to 3-2 after this one as Big Ben & co. are busting to get back on the field and at 1-2 need this game much more. Vikings over the Titans- Tennessee has given up an average of 38 points a game so far this season. Even with last week’s 141 yard season breakout rushing performance by RB Chris Johnson, they’ll need to find another way to overcome the Vikings lean defense that only allows 2.4 YPC to opposing backs. The Titans have been blown out in 3 of their 4 games and will have a difficult time fostering any offensive threat this week. QB Christian Ponder (knee) will play and should have a decent day. 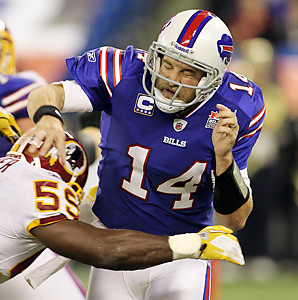 49ERS over Bills- In defense of the Bills, QB Ryan Fitzpatrick leads the league in touchdown passes with 12. However he is prone to panic in games where he is playing from behind and against the number one defense in the league last year, it should mean more of the same. He already has 7 interceptions-a number that will probably increase on Sunday. The Bills lack of defense (they have given up 100 points in 2 games vs the Jets and Patriots), should make this a lopsided affair in the city by the bay. BENGALS over the Dolphins- This game could be closer than expected as the Dolphins have lost some close ones late in games. The last two, vs the Cardinals and the Jets, were lost in overtime no less. Historically, the Fish play better on the road and even though QB Ryan Tannehill has been connecting with his receivers, especially WR Brian Hartline of late, he’ll be facing a very hot Andy Dalton, ranked fourth in fantasy points in Yahoo! leagues, who has 8 touchdown passes to his credit this season. So we’ll just say Cincy is a close one. Texans over the JETS- Although there should be no way that the Texans lose this game, our initial reaction was that this could be a ‘trap’ game for Houston. Needless-to-say, that feeling was short lived. Yes, it’s a small possibility but with an Arian Foster and the 9th best rushing team going up against a Jets team that’s 31st against the run, it doesn’t look good for the 2-2 home team. With a decimated receiving corps, and a QB who has a season league low 49.2% completion rate (and that was with Santonio Holmes), one has to wonder where the Jets points will come from. I’m so glad I gave up big time wagering ! Had I been a betting man and be duped into the lines being set for last night’s game , I’d now be thinking about doing something crazy and downright criminal , like chasing after Kolb with a metal bat ! lol…i don’t wager on any sporting event. Can’t get into too much trouble just prognosticating..
As a kid my father taught me about betting on horse racing . He taught me how to read the race forms and everything about the whole industry . As I got older , I took some of that knowledge to parlay it , into betting on other sporting events . Specifically , Wimbledon , and what was then the precursor to Premiership soccer , with the First Division . Now it’s only once in while that I might actually lay a wager , and now it’s primarily on an MMA event . Won’t be betting on outcome of the November elections though , that’s simply shoving money into the hands of the odds-makers for no apparent reason . A’s fans are happy , while Rangers’ fans have become suicidal . What the hell happened in that game ? 5-1 up in the fifth inning , only to lose 12-5 , and with it went the AL West divisional crown . . Injuries played its part in derailing the hopes of both the Angels and Dodgers over the course of the season . Yet that should be no excuse for their undoubted failure . I’m now watching the Braves fold like ” cheap suit ” in the game against the Cardinals , as things now seem to be winding down towards its inevitability . Damn ! My Braves play themselves into contention and then “wimp out ” ! Those mighty Dolphins kept you from going undefeated this week. Yep..YOUR Dolphins. Although if you saw my picks I DID say that the game was going to be close and it sure was..
9-1 in the last two weeks-Doesn’t get much better than that! !